Competing in 100-meter dash are a handful of Houston athletes owning the top eight spots in The American this season. Mario Burkesits in the No. 1 spot with a season-best time of 10.07, Brandon Taylor in second with 10.18 and No. 7 in the nation, Nicholas Alexander in fourth with 10.35, Terence Ware tied with Edward Sumler IV in the No. 5 spot with a time of 10.44, Jordan Booker in seventh with a 10.45 and John Lewis III in the No. 8 spot with a time of 10.46. Also in the 200-meter dash are multiple conference-ranked Houston athletes. Kahmari Montgomery is currently ranked first with a time of 20.41 and No. 1 in the nation, Alexander in second with a 20.76, Sumler IV in the No. 4 spot with a 20.95 and Trenton McDonald in seventh with a 21.03. Competing in the 400-meter dash is Jermaine Holt as he ranks No. 2 in The American with a time of 46.55 and Frederick Lewis in fourth with a time of 47.29. In the 800-meter run, Cameron Laverty will compete as he ranks second in The American with a time of 1:50.79 and Christian Gilmore as he ranks No. 5 with a time of 1:52.25. Quivell Jordan will be competing in the 110-meter hurdles as he ranks second with a time of 14.17. The men’s 4x100-meter relay will be competing as they stay on top in the conference and sit No. 2 in the nation with a time of 38.45. The men’s 4x400-meter relay will also be competing as they sit in first place in The American with a time of 3:07.37. Colin George and Brendon Rivera will be competing in high jump as they are tied for third in the conference with a height of 6-9.75 (2.08m). Ben Percefull will be competing in pole vault as he ranks third in The American with a height of 16-6.75 (5.05m). Felipe Valencia will be looking to stay on top in shot put in The American as he owns first place with a throw of 59-11.25 (18.27m). Triston Gibbons will also be competing as he ranks third in the conference with a throw of 58-1 (17.70m). Competing in the discus throw is Triston Gibbons as he ranks second in the conference with a throw of 179-4 (54.67m). Kenneth Sessums will also be competing as he ranks sixth with a throw of 161-9 (49.30m). Samiyah Samuels will be competing in the 100-meter dash as she ranks No. 2 in The American with a time of 11.58. Also competing is Ashley Seymour as she ranks fifth with a time of 11.64. Finally, Justice Henderson will compete where she ranks eighth with a time of 11.78. Britani Gonzales will be competing in the 1500-meter run where she ranks fifth in the conference with a time of 4:30.33. Naomi Taylor will compete in the 100-meter hurdles as she ranks on top in The American with a time of 12.84. Whitney Ochiam will also compete as she ranks eighth with a time of 14.38. The women’s 4x100-meter relay team will compete to seek first place in the conference as they rank second with a time of 44.77. The 4x400-meter relay team will compete as they rank fourth with a time of 3:43.18. Samuels will also compete in long jump as she works to stay on top in the conference with a mark of 20-7 (6.27m). Phedenia George-Mosbey will also compete to move up in the rankings where she ranks No. 4 with a mark of 19-6 (5.94m). Hailey Pollard will compete in the discus throw where she ranks fourth in the conference with a throw of 158-2 (48.21m). 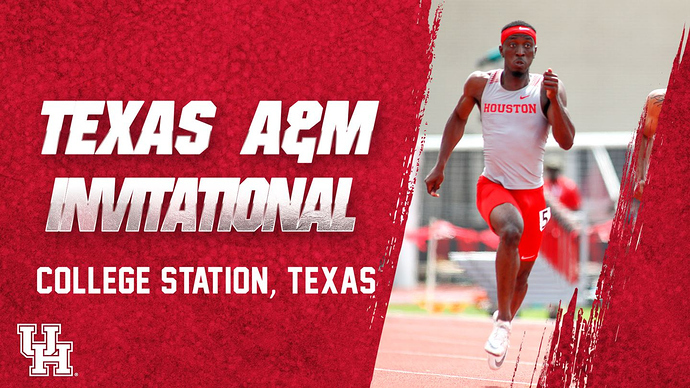 Live results for the meet will be available courtesy of Flash Results Texas and can be found by clicking HERE. The Houston Cougar Field team opened the Texas A&M Invitational on Friday with six top-three finishes and two wins in eight field events. Priscilla Adejokun finished first in the hammer throw with a PR of 196-1 (59.77m) to bump up to the No. 2 spot in UH history, break the E.B. Cushing Stadium record and move to No. 5 in The American Athletic Conference this season. Mikaila Martin followed right behind in second with a mark of 187-0 (57.00m). Trumaine Jefferson finished on top in long jump with a wind-aided mark of 25-1.75 (7.66m) to move to No. 3 in The American and No. 22 in the nation. Kenneth Pree took third in the event with a PR of 23-8.25 (7.22m). Samiyah Samuels placed second in the long jump with a wind-aided mark of 20-7.25 (6.28m) to improve her top mark in The American. Naomi Taylor moved to No. 3 in The American this season with a top jump Friday of 19-7.50 (5.98) while Phedenia George-Mosbey improved her No. 5 conference mark at 19-6.75 (5.96). Brendon Rivera finished third in the high jump, clearing a height of 6-8.25 (2.04m). Kahmari didn’t run at aTm relays? Was he held back after running at UH invitationals? Probably. Coaches schedule these guys out during the season to build them for the national championship. He’s already qualified for regionals so there’s no point in overdoing it right now. What about the 4x4 race last night? Did we have our A or B team in College Station? Is coach Burrell tweaking the lineup? The Houston Cougar Track & Field teams ended the Texas A&M Invitational on Saturday with 18 top-three finishes and six event titles. The men’s 4x100-meter relay team took home first place and finished with a time of 40.38. Hailey Pollard finished on top in the discus throw with a PR of 159-5.00 (48.61m) to move to No. 5 in The American Athletic Conference. Naomi Taylor finished first in the 100-meter hurdles with a wind-aided time of 13.25. Quivell Jordan also came in the top spot in the 110-meter hurdles with a wind-aided time of 14.20. 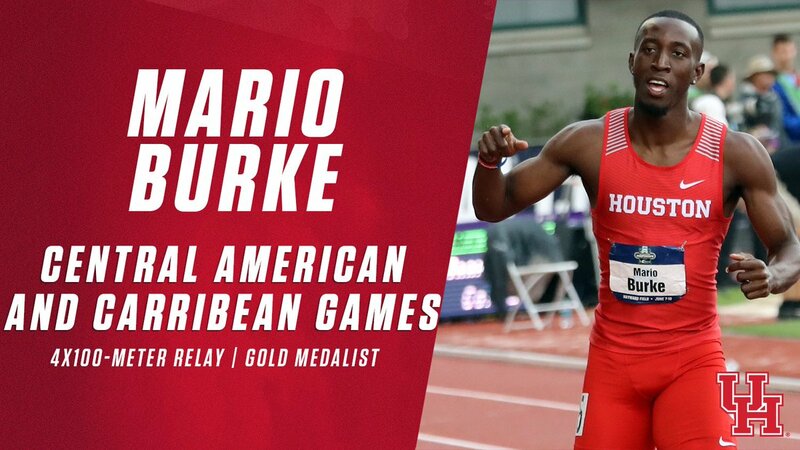 Mario Burke finished in the No. 1 spot in the 100-meter dash with a wind-aided time of 10.24. Finishing right behind in the 100-meter dash was Brandon Taylor with a wind-aided time of 10.39. Nicholas Alexander finished third in the event with a wind-aided time of 10.43. 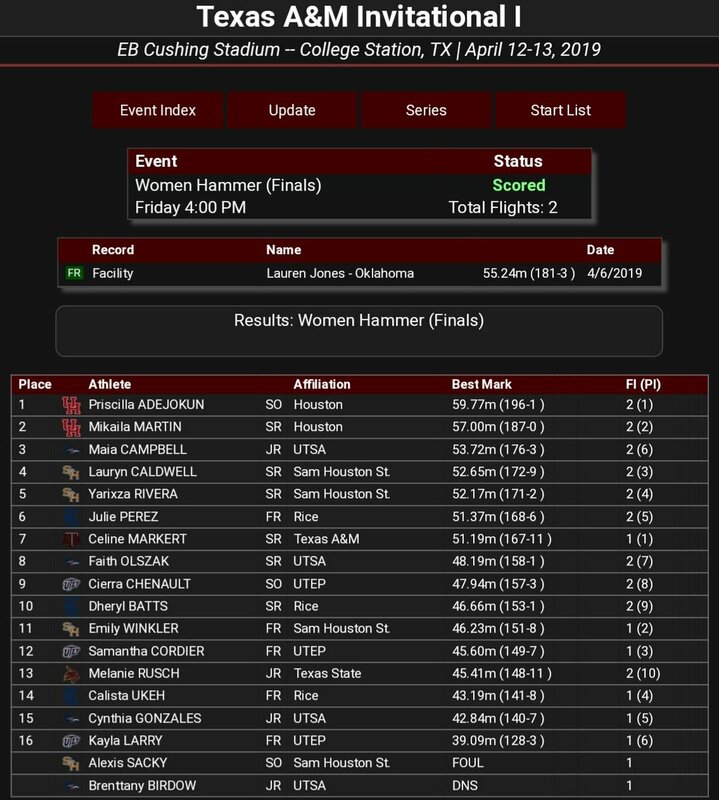 Houston swept the 100 as Essance Sample claimed the women’s win in a time of 11.54. Burke also claimed the 200-meter dash win with a time of 21.13 with Alexander taking second in a time of 21.31. Coming in second in the 400-meter hurdles was Erin Derrow with a time of 1:04.07. Jennifer Dunlap finished second in the 1,500-meter run with a time of 4:38.60. The women’s 4x100-meter relay squad came in second with a time of 45.52. The men’s 4x400-meter relay team finished second with a time of 3:16.15. Priscilla Adejokun took second in the shot put with a top throw of 46-10.00 (14.27) to move into No. 7 in The American. On the men’s side of the shot put, Felipe Valencia also took second with a throw of 58-3.25 (17.76). Meredith Sorensen finished third in the 3,000-meter Steeplechase with a time of 11:13.89. Jermaine Holt came in third in the 400-meter dash with a time of 47.77.